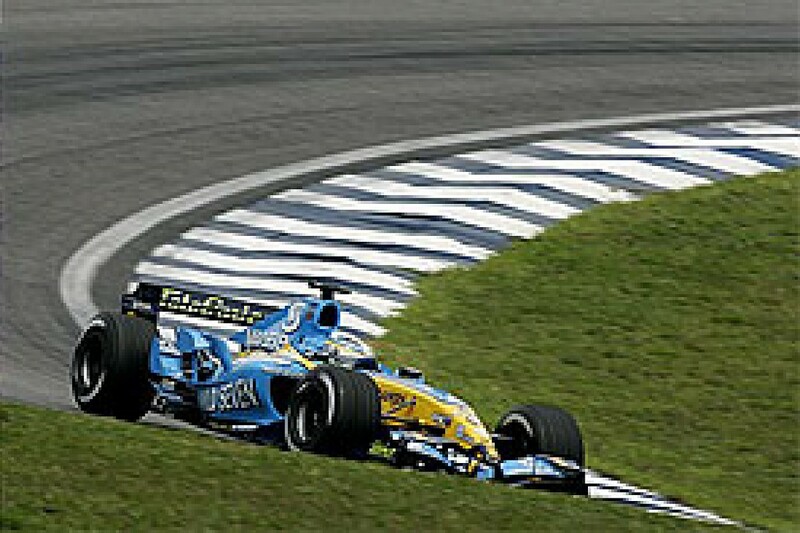 The main changes we saw in strategy for 2005 were solely down to the single tyre rule. This year, we were generally using harder tyres than in 2004. As such, the 'golden laps' from the tyres - the performance advantage that comes from new tyres - was only present once, in qualifying, and couldn't be exploited to strategic advantage. This meant that generally, we made one less stop at each race than in 2004. Secondly, the shape of the races changed. Harder tyres meant lower degradation (the amount of performance a tyre loses in normal conditions), so cars were nearly as quick at the end of their stint, on low fuel, as they had been at the start with newer tyres. This meant that particularly for the first stop and even for the second, you tried to push the stops as far back as possible to gain track position. As a result, strategies were often 'rearward biased', with two long stints followed by a shorter one. McLaren were obviously our main worry at most races, but when you are planning a strategy, you are always looking for those people doing something different, or having a good weekend. Toyota's technique of qualifying with low fuel, or the pace of [BAR's Jenson] Button in Turkey for example - you cannot afford to ignore them as they can determine how you run your race. You try not to use pre-defined rules, because patterns become apparent and they can trap you. We try and take things race by race, to out-think our opposition. If you work to a pattern then it makes the other team's guessing games easier. And that's another key point. Strategy isn't just about what lap you stop on or your fuel loads. It is how you approach the weekend, even how you approach the entire season with your engineering decisions and how conservative or otherwise you decide to be. All of that comes under strategy. In terms of the race strategies, you have to constantly re-learn and adapt. But I have learned that the early races really set the scene for the year. In a mathematical sense, each race is worth ten points but that view doesn't take account of the human component, the heart of the racing. When you get that first win, it buoys up the team, they start to believe in themselves, and the wins that follow just help that grow. The early races may have the same mathematical importance, but in terms of the team's self esteem, they are worth half as much again. But China, the last race, was my favourite without a doubt. We made strategic decisions all through the weekend and used every little trick to fool the opposition: running unusually in practice, being coy in our press releases. We arrived in Melbourne confident in our pace, but unsure of our ultimate speed. In testing, we didn't know how we could separate ourselves and McLaren, while we didn't quite dare write off Ferrari even though we thought they were not at their usual level of competitiveness. Furthermore, the tyre choice was conservative because it was such an unknown. We had run to 300 km on cold European tracks, but not in the heat of battle, so we decided to take quite a hard tyre to the first race. Indeed, I think that flattered Ferrari somewhat, who had a more aggressive tyre that allowed Barrichello to race well to P2. The weekend was dominated by the rain-affected qualifying session. This left Giancarlo in a perfect position on pole, and with a relatively easy race. Even there, though, there was uncertainty because we didn't know what other cars the front might do in terms of strategy. In previous years we had seen that our approach to strategy in the opening races was often different to other teams, so we just maintained the courage of our convictions and did our normal thing. That seemed to suggest Giancarlo's race would be quite straightforward, as it proved. 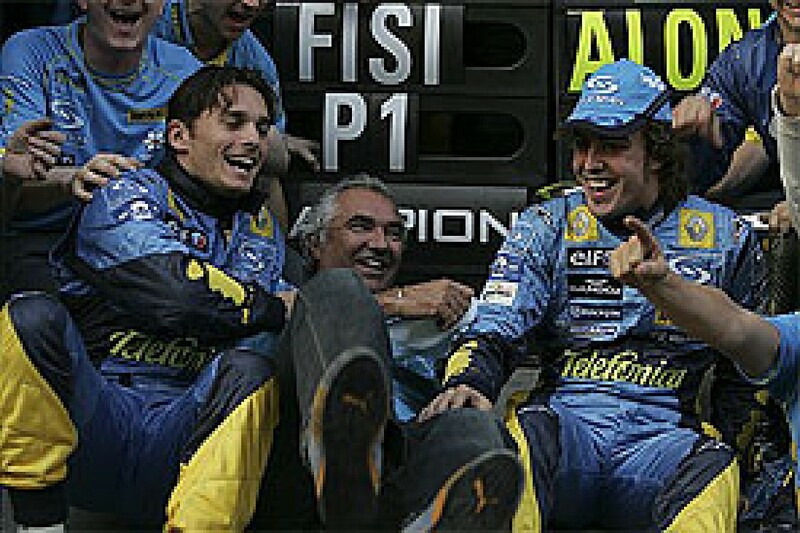 The first thing was we saw the effectiveness of a rearward biased strategy under the 2005 regulations, which we learned after taking some gambles with Fernando's race. But the surprise was the relative lack of performance from McLaren. Their weekend never really came together, and Fernando was able to start behind them, overtake at the stops and finish in front. Since Australia, our tyre choices had gradually become more aggressive race by race. In terms of tyres, Monaco poses some tricky problems. Firstly, there is nowhere you can test effectively for the circuit so you don't have your usual database of information about tyre performance when you arrive. And secondly, we traditionally think that single-lap performance is all that matters in Monaco - we don't worry about degradation or being overtaken, assuming that you can keep anyone behind in Monaco. Also, we hadn't at that stage appreciated all the different mechanisms of tyre wear as we should have done. As such, we went there with quite an extreme set-up on the car to get optimum single lap and short run performance, and the 'raciest' tyre choice of the year. The main event of the race was the Safety Car that came out on lap 25 following the crash at Mirabeau. We chose to pit both cars, and fuel to the finish. This extra fuel load added about 4% to the rear tyre energy and while it certainly exacerbated the rear tyre wear problems we were experiencing, I believe that with how the car was set up that weekend, it was inevitable we would be overtaken later in the race. In terms of the decision to pit both cars when the Safety Car came out, I think it was the right one based on the information we had at the time. Raikkonen tried to pit but the call came too late. We did so, but Giancarlo lost a huge amount of time after his fuel flap failed to open, something that had to be done manually by the mechanics. It left us in the strange situation of finding ourselves losing performance after doing the 'right' thing strategically, while Raikkonen made a mistake - but was able to build a big cushion in which he could make his pit-stop as Fernando held up the cars behind him. Fernando had lost temperature in his tyres, which meant they had less grip, were generating less temperature, sliding more so wearing more, and he, like Giancarlo, found himself caught in a spiral of exponential tyre wear. He lost position to both Williamses late in the race, but was still able to take P4 and 5 points - a fantastic drive. The real lesson we learned was the importance of tyre wear, and its different mechanisms. In 2004, degradation was our preoccupation - not pure wear. Before Monaco, we hadn't appreciated as fully as we should have done, all the different mechanisms of tyre wear and after that race we looked at the phenomenon in a lot more detail. In retrospect, our fundamental problem in Monaco as the car had not been set up to take enough account of tyre wear, and while we may not have been overtaken until later in the race, I still think it would have happened anyway. The decision to fuel to the finish under the safety car certainly compounded the situation, but it was not the fundamental problem. This a race where the team arrived needing to bounce back from a tough result in Monaco just one week earlier. Tyre wear was obviously at the forefront of our preoccupations after the previous race, and we needed to ensure we got a solid result to maintain championship momentum. It was not the time to be taking big risks. 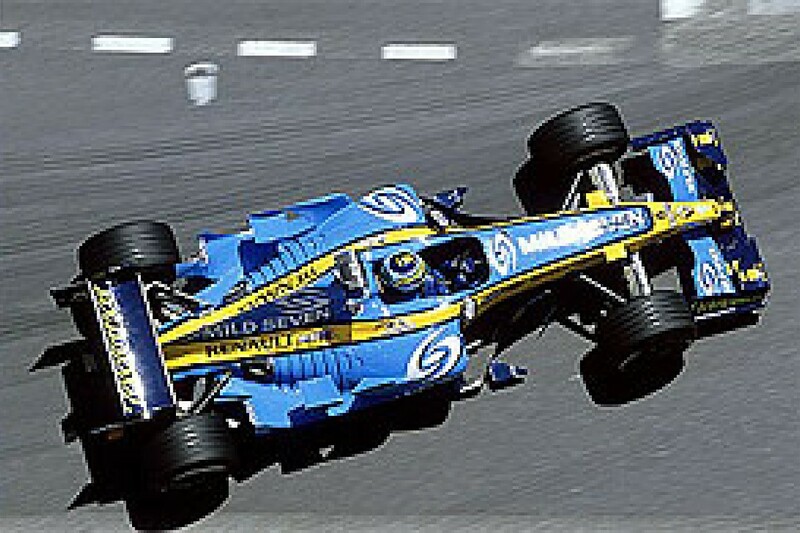 Fernando failed to get a clean start, being hit by Ralf Schumacher in turn one, nearly spinning and losing position to [David] Coulthard who held him up for almost the entire opening stint. Williams were running a three-stop strategy but even with the handicap of a slow first stint, we knew the pace in the car meant Fernando did not need to worry about them. As for Giancarlo, his car stalled on the grid meaning he started from the pit-lane. Already running a rearward biased strategy, the logical conclusion was to extend this to allow him to gain as much track position as possible. It worked to great effect, and he passed five cars at his second stop to bring him into P6 at the end. The pressure we managed to apply to Kimi was not a deliberate strategy - rather a consequence of the tyre decision we made, and the strategy that it brought about. As for Giancarlo's race, it once again confirmed the effectiveness of pushing stops as far back as possible in order to gain track position. Silverstone was very much a defensive weekend from start to finish. I think this was a product of the June test we had done, where Raikkonen had put in an extremely quick lap of 1:16.953, running what we can now say was clearly low fuel. In hindsight, I think we were slightly out-psyched by this, and we went into the race under-estimating our own pace. We expected we would need to be defensive in order to maintain our position in the championship. The significant racing event of the weekend was Raikkonen's ten-place engine penalty. We had been planning a two-stop race, and this forced us to adopt an even more defensive approach because we were dealing with an unusual problem - two rival cars at different ends of the grid. That meant not only did Fernando have to fight Montoya, he also needed to contend with Raikkonen coming through the field - and ensure that he did not lose track position to him. Owing to the situation in the championship, Raikkonen was our priority - even if it meant sacrificing position to Montoya. Kimi would clearly run long in the first stint, but options then opened up for McLaren: they could have short-stopped Montoya to ensure he got track position and had him hold Fernando up through the second stint and allow Kimi to close from behind. In this event, if we were short fuelled in the second stint, we would inevitably lose track position to Raikkonen around the second stops. As such, we left ourselves the option to fuel Fernando long in the second stint to counter any possible team tactics from McLaren. As for Giancarlo, he ran a classical strategy from P6. The long first stint allowed him to gain position over lighter cars in front, so we then shorter fuelled the second stint to give him track position after the first stop, and allow him to build a gap over the cars behind. He closed on Fernando thanks to his fuel advantage of around 0.3s a lap, before then pitting three laps earlier. In the end, a stall at the second stop, following a slow first stop, cost him a podium finish. In Silverstone, a conservative strategy had been coupled with good vehicle performance, and actually slightly masked our true pace. In Turkey it was the reverse: we needed to employ an aggressive strategy in order to compensate the performance deficit of the car. What's more, we came into the weekend determined to be aggressive after being taught a lesson in Hungary. There, we had qualified low down the grid and got caught up in first lap incidents that meant we finished outside the points. So for Istanbul, the message was clear: attack is the best form of defence! As the practice sessions unfolded, it became clear that we were off the pace - and as it transpired afterwards, this is probably where our performance deficit to McLaren was at its greatest at around 0.8s per lap. This led us to adopt by far our earliest stops of the year, measured as a percentage of race distance: it was under ¼ distance when Fernando headed for the pits. 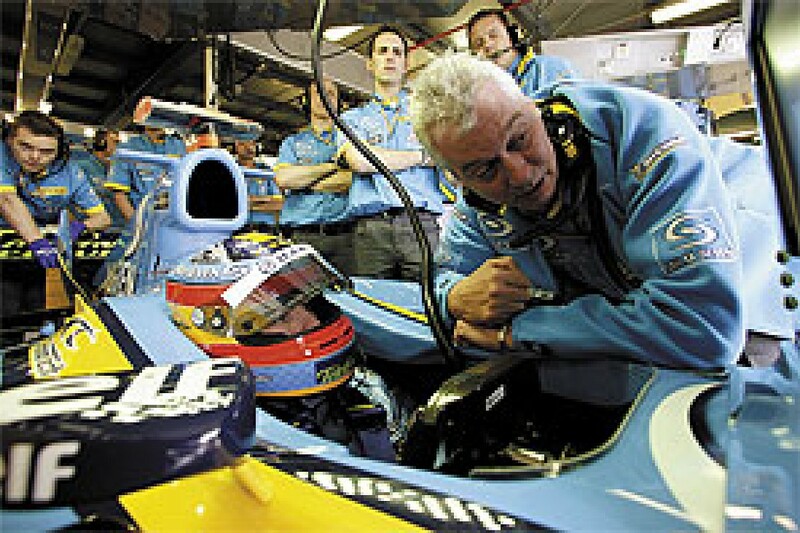 Effectively, we ran a 2004-style 'forward biased' strategy, with a short first stint then two longer ones - where in 2005, the norm was for this shorter stint to come at the end of the race. The objective was to be racing the McLarens in the early laps, and to gain good track position relative to the cars behind that would allow us to get onto the podium. The early stop left open the option of converting onto a three-stop strategy - a decision we would only make during the first stint. In the event, we chose not to and it worked out very well. Fernando was close enough to Montoya to take advantage of his late-race mistakes to take P2, while Giancarlo finished ahead of Button in spite of fuel rig problems. Given that Jenson had looked quick enough to beat us on pure pace at stages of the weekend, this was quite an achievement. We arrived on the back foot after Hungary, and couldn't afford the risk of starting in the field and being caught up in incidents on the opening laps. So we got good track position in qualifying and then raced to make the most of it. The strategy was not an unusual strategy per se, rather a product of unusual circumstances, namely our lack of competitiveness over the race weekend, and a logical way of adapting to it. It was a good example of how well our team adapts to unexpected circumstances, and we scored a better result than we would have done on a more conventional strategy. Prior to the race, we were trying to think out of the box: we had just lost the lead of the Constructors' Championship for the first time in the year and we knew it would need something special to get it back. However, we went to Suzuka confident in the car's performance. We had made a step forward in Brazil, and the circuit's characteristics are very similar to Silverstone, where we had been quick. The rain that fell through much of the weekend really put paid to the three stop idea. As it became clear on Saturday morning that it might rain during qualifying, the risk of finding ourselves at the back of the grid on a light three stop fuel load was too great to justify the risk. So we converted to a two-stop fuel load, and planned to run a fairly normal race. Fernando produced one of the greatest first laps I have seen in Japan. It was so good that it actually left us slightly confused at the start! 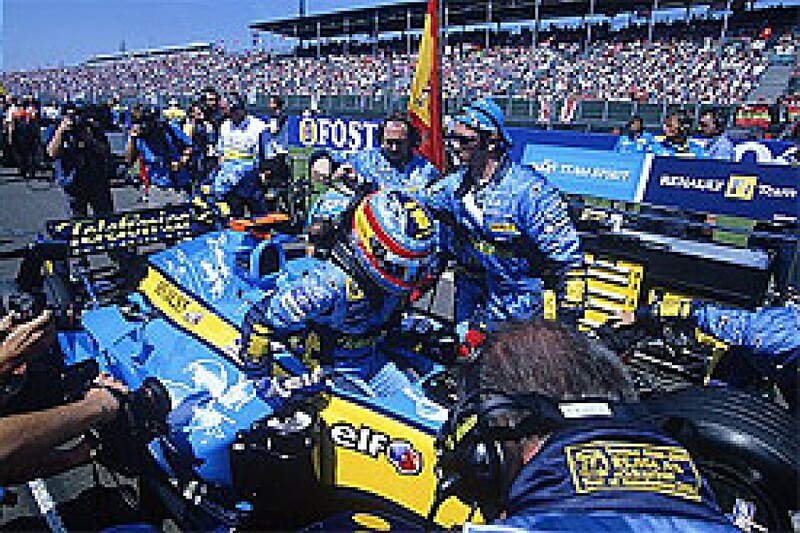 When a safety car is deployed early in the race, then the logical decision for cars at the back is to pit and refuel - and it was planned that way for Fernando. However, he had made up so much ground that by lap 2, it was no longer the sensible option! After that, his race took on a much more normal pattern. However, we were left with very little latitude in terms of his strategy. There was some suggestion that the short second stint cost him in terms of finishing position, and left him with a lot of cars to pass after each stop, but in reality it worked to his advantage. Had he been fuelled longer, as Raikkonen was, the time penalty for carrying extra fuel at Suzuka is so high that he would not have been able to overtake the cars in front like Webber or Schumacher. Indeed, we could have gone even shorter on the second stint to help him get through the traffic more easily. Instead, the event that really cost us was the penalty from the FIA when Fernando had to slow down, allow [Red Bull's Christian] Klien to re-pass him, and then overtake the Red Bull again on lap 11. 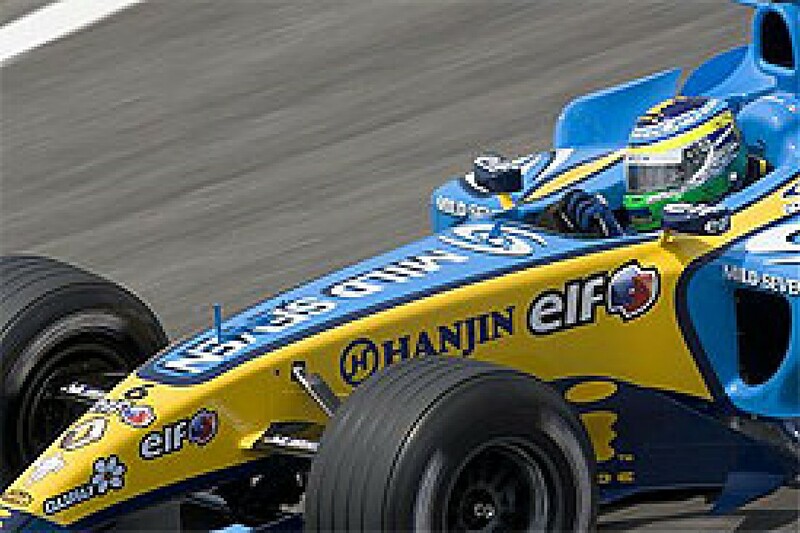 It cost Fernando 8.8s, and without that, he would have emerged from the pits ahead of Raikkonen after the first stops. Had that happened, I am confident we could have scored a one-two finish, with Fernando's better tyre condition allowing him to hold off Raikkonen to the finish. China was approached with a simple philosophy: win or bust. There would be no second chances after this, and we had to perform on the day. Our analysis after Suzuka showed there was nothing between us and McLaren, and then a big gap behind us to the next teams - in Japan, it had been Williams with Webber. We had an engine development coming that gave us a very measurable improvement in lap time, and the only note of caution was that our race in China the previous year had been very poor. So we went to China confident, and determined to race McLaren all-out for the title. We planned our strategy for the weekend with confidence and felt that if everything stuck to its normal patterns in terms of performance, then we could do it. But we also thought that if we didn't show our rivals what the true picture was, then that would be an asset. We had stopped earlier than McLaren throughout the summer when our car was not quick enough, so if they thought that was how we were still running, it would be great as we figured they would run normally. The other thing that became obvious as the weekend unfolded was that McLaren were not performing to their usual level. The car did not look at ease and, as it became apparent in the race, not only had we made a step forward but also they fell off their game slightly in China. So before the race, as we planned qualifying fuel loads, we made another assessment of our pace and planned to match McLaren in terms of fuel load. We did not want to be arrogant and try to go longer on the first stint, but we targeted our first stops to be at the same point. And qualifying played into our hands with Fernando driving a mega lap, Giancarlo a very good one and Kimi making some mistakes... This left us with the significant strategic advantage of having both cars on the front row. Qualifying set up the strategic game of the tortoise and the hare for the race. We knew that to get the win, Fernando would need a 13 second advantage at the first stops to protect against any possible problems with tyre wear later in the race, which had seemed marginal in practice. Giancarlo did the perfect job, driving a fabulous opening straight in which he blocked both McLarens, held position and then ran comfortably ahead of them. The two safety cars required some quick reactions, but in both cases, pitting was clearly the right thing to do. It cost Fernando at least 30 seconds in total, and may have cost Giancarlo a second place finish. But had the safety car not been called out at all during the race, I am confident that the result would have been very similar to how things turned out, if not better. China was a satisfying win thanks to the completeness of the strategic approach, from the beginning to end of the weekend. And it further reinforced the lesson that there are no rules to strategy - rules become habits, and habits only serve to make you vulnerable to your competitors. That is the real lesson we take into the winter to avoid any complacency for 2006. 13:30 The red light at the end of the pit-lane turns to green. Immediately, some cars leave their garages and go to the grid. Clouds are massing all around Interlagos, but there is no chance of rain. A mass of journalists and photographers crowds in front of the Renault F1 Team garage. Flashes go off in all directions when Fernando puts on his helmet and climbs into the cockpit. The RS25 V10 is fired up. Fernando lowers his visor, and engages first gear. 13:34 The number 5 Renault R25 stops on the grid. Immediately, it is surrounded by dozens of cameras. Fernando seems tense. He takes his helmet off, speaks to his engineers, then returns to the garage to escape the rising tension. 13:53 Fernando, who had hidden nearby the pit-lane, comes back to the grid and installs himself at the wheel. The siren sounds, telling journalists to leave the grid. Slowly, the crowd thins and only the team is left around the car. 13:57 "Three minutes, three minutes to go"
13:58 "Take off the tyre warmers. Car on the ground please." 13:59 "Ok, fire up please." 13:59 "One minute to go. Remember the fifteen second rule." 13:59 "Thirty seconds... Twenty seconds... Ten seconds"
FORMATION LAP. The red lights are extinguished, and all the cars leave the grid, following Fernando around the parade lap. The spectators are standing in the grandstands. 14:01 "Fernando, keep your traction control settings as they are for the start, OK?" 14:02 Fernando comes to rest on pole position. START Fernando makes an impeccable getaway. 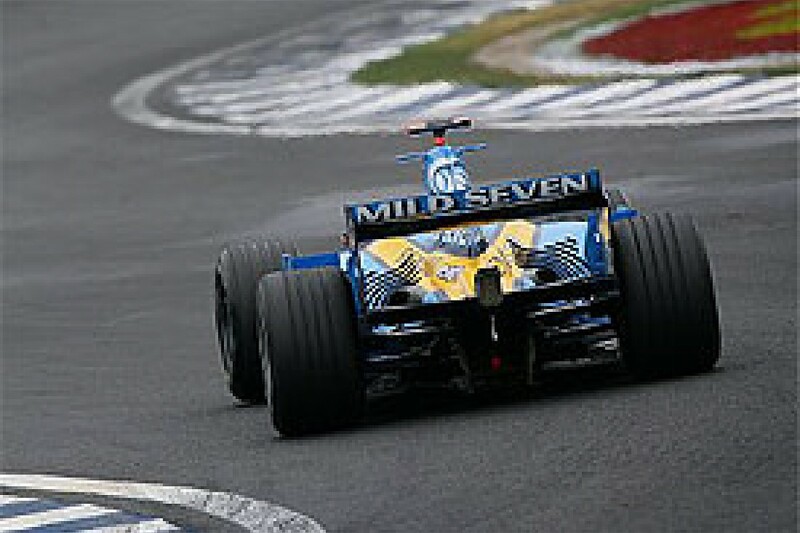 He leads the McLaren of Juan Pablo Montoya at the first corner. Giancarlo remains third, while further back, the two Williamses collide. There is relief in the Renault F1 Team garage as both cars make it through intact. Lap 1: Kimi Raikkonen (McLaren) and Michael Schumacher (Ferrari) overtake Giancarlo. Race control sends out the safety car while accident debris is cleared up. "Safety car, safety car! Stay out Fernando." "Mixture 3 please, safety car in at the end of the lap"
"Giancarlo, Jenson is right behind you. Try to pass Michael at the re-start"
Lap 3: The safety car heads for the pits and the race re-starts. 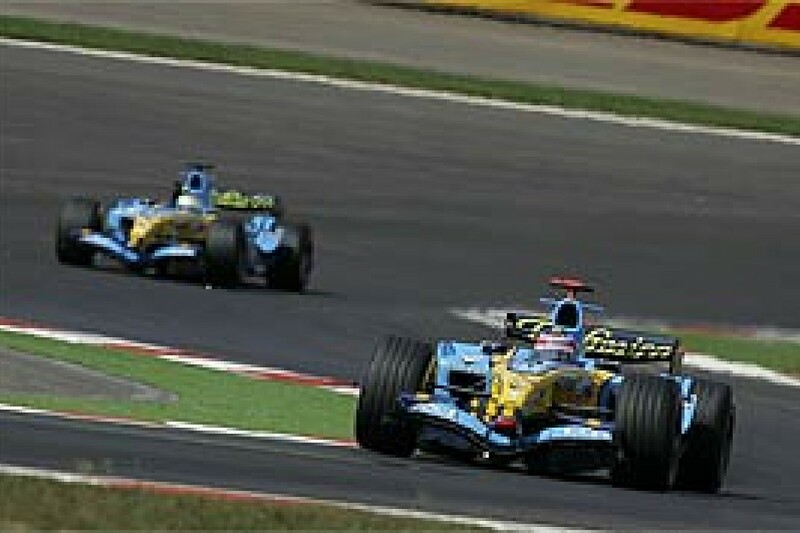 Giancarlo succeeds in overtaking Michael Schumacher (Ferrari). 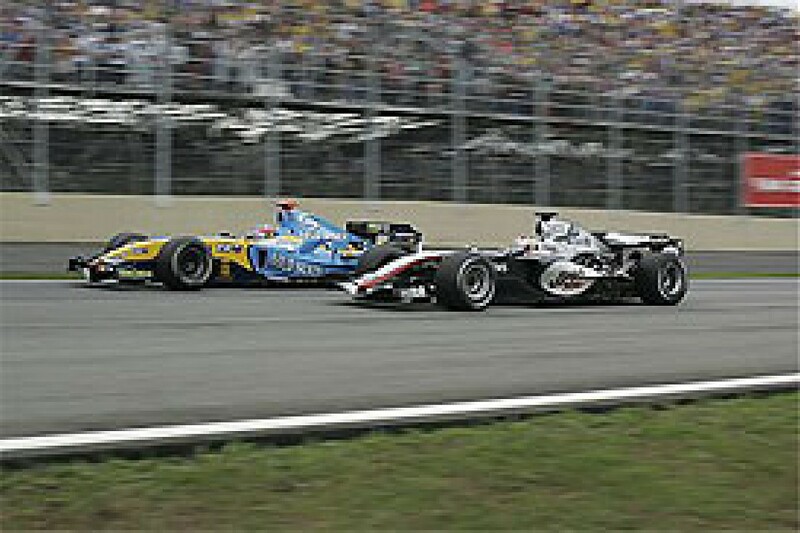 Up front, Fernando is overtaken by Montoya's McLaren. The race order reads: Montoya, Alonso, Raikkonen, Fisichella, Schumacher. Lap 6 Fernando sets fastest lap. He is three seconds behind Juan Pablo Montoya. "You need to push Giancarlo. You are seven tenths slower than Fernando." Juan Pablo Montoya sets fastest race lap. "Fernando, how is the car balance?" FA: "Good, good. Race order"
"Montoya, then 4.2s, Alonso, then 2 seconds, Raikkonen, then 2.4s, Fisi, Michael and Button"
"Fisi is staying with Kimi. He can put some pressure on him"
Laps 14 to 16: Fernando is running faster than Juan Pablo Montoya. The gap goes from 4.0s to 3.6s. "Fernando, how's the balance mate?" At the end of the lap, pit-stops begin with Felipe Massa's Sauber first in. FA: "Race order, race order"
"Montoya, Alonso, Raikkonen, Fisi, Michael, Button"
"Giancarlo, you need to be two tenths faster please"
Lap 21: Fernando sets the fastest lap in 1:12.824. The gap to Juan Pablo Montoya is 3.8 seconds. Lap 23: Fernando enters the pit-lane to refuel for the first time. "Mixture five, everything's OK. Remember the limiter." 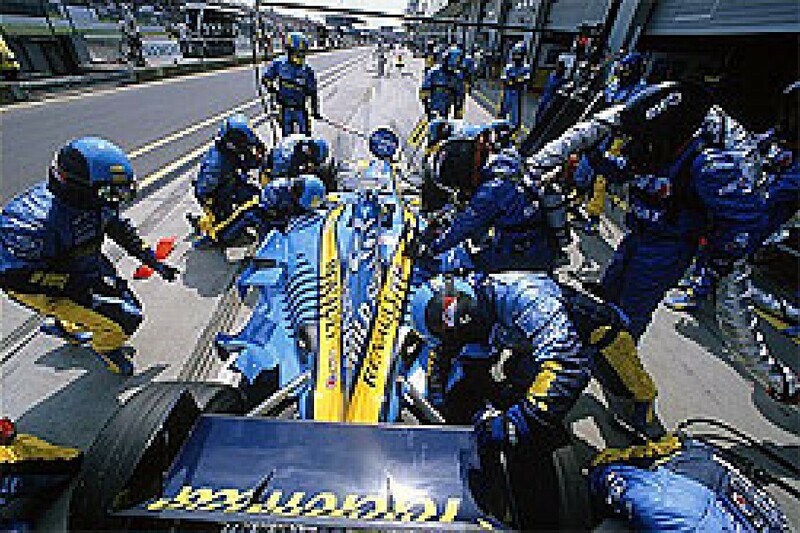 The mechanics fill the car and adjust the tyre pressures. "White line! Remember the white line!" Lap 24: Giancarlo enters the pit-lane. He stops for 8.5s, and is back on track. "Fernando, you can over-ride the cruise to overtake." "Giancarlo, you need to push. Michael is stopping at the end of this lap!" "Fernando, Michael and Jenson are stopping. You will be P3"
Lap 26: Michael Schumacher (Ferrari) and Jenson Button (BAR) refuel. The German's Ferrari gets out ahead of Giancarlo. Fernando is running third. Lap 28: Juan Pablo Montoya (McLaren) heads for the pits. He comes out in second place, behind his team-mate Kimi Raikkonen. Lap 29: Kimi Raikkonen sets fastest race lap: 1:12.178. He is attacking hard to secure P2 from Fernando when he emerges from the pits. "Fernando, Michael is nine seconds behind you"
Kimi Raikkonen stops. He rejoins in second position. "Fernando, here's the situation: Montoya and Raikkonen are in front of you. You have a 12 second lead on Michael. Fisi is 0.5s behind. Then it's Sato, Button and Trulli"
"Giancarlo, Michael is slow because he is very heavy. You are losing 1.5s a lap to Fernando. You need to overtake the Ferrari. Go for it! Button and Barrichello might get past at the end of the race if you don't do it. Go!" "Fernando, here's the situation: Montoya first. Then 2 seconds. Raikkonen. Then 9.8 seconds. Alonso. Then 15.5 seconds. Michael. Then 1 second. Then Fisi." "Giancarlo, what's the problem? What's happening with the car?" "OK. Go to TCS (traction control) 6. You need to look after the rear tyres." FA: "Blue flags! Blue flags!" "Yes, there are three cars fighting in front of you. We've told race control." It is Takuma Sato (BAR), Jarno Trulli (Toyota) and Felipe Massa (Sauber). "OK. The positions are Montoya, Raikkonen, Alonso, Michael, Fisi and Button"
FA: "I want a quarter turn of front wing"
"OK. Quarter turn on front wing." To the mechanics: "Pit-stop in 40 seconds. Tyre pressures and front wing adjustment." Fernando's car enters the pit-lane. "Fernando, remember the limiter, limiter"
Fernando stops in front of the garage. "Limiter! Limiter! White line! Remember the white line!" To the mechanics: "Giancarlo is pitting in 40 seconds. Lower rear tyre pressures, and adjust the front wing." Giancarlo pits. The stop goes smoothly. "Limiter! Limiter! White line! White line!" "OK Giancarlo. You are in front of Barrichello. He will stop soon, but he is very quick at the moment. The Bridgestones are working well. Don't let him past." Lap 50: Rubens Barrichello's Ferrari heads for the pits. "Giancarlo, you can't give up now. Fernando is doing 13.7. He is much faster than you!" Lap 54: Montoya's McLaren dives into the pits from the lead. Michael Schumacher's Ferrari, running behind Fernando and who Fisi wants to overtake, also stops. "Giancarlo, Michael is stopping. Push, push, push!" Michael Schumacher emerges ahead of Giancarlo. FA: "Is Fisi 4th, or is it Michael?" "You are third. Raikkonen is ahead. Then 17 seconds. Montoya. Then 24 seconds. Alonso. Then 15.8 seconds. Michael. Then 4.9 seconds. Fisi. Everybody has stopped apart from Raikkonen." "Giancarlo, it may rain before the end of the race, so stay with Michael." GF: "It's not easy mate"
Lap 61: Kimi Raikkonen pits and emerges second, behind Juan Pablo Montoya (McLaren). Lap 67: Flavio returns to the pit-wall. "OK, here's the situation: Montoya. Then 1.2 seconds. Then 17.7 seconds. Alonso. Then 17.5 seconds. Michael. Then 5.1 seconds. Fisi." 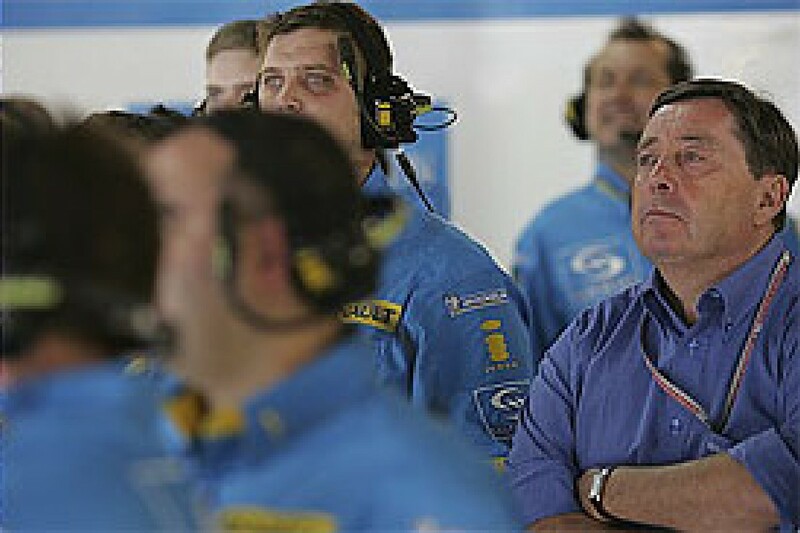 Pat Symonds, Executive Director of Engineering, and Team Manager Steve Nielsen study the sky. There are only five laps left. Will it rain? "Fernando, if it starts to rain, just make sure you get to the finish"
FA: "It won't rain mate. No rain!" Lap 71 Fernando begins his last lap of the race. 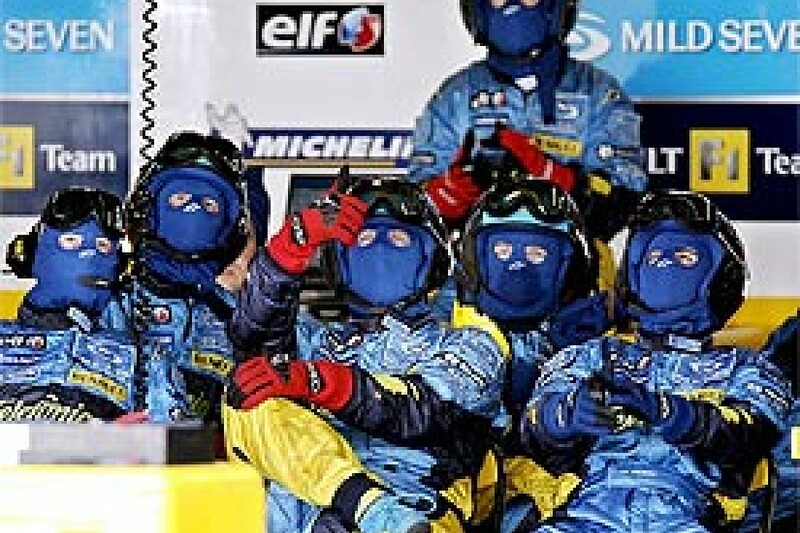 The Renault personnel run to the pit-wall and climb the fencing. The blue tide is waiting for the number 5 Renault while the engineers, studying their screens, have a last look at the real-time telemetry. No problems: the R25 is humming along nicely. FA: "What's the gap? Gap to Michael?" End of lap 71: When the R25 appears on the horizon, the garage erupts. The noise is almost the same as the engine's 60 decibels! 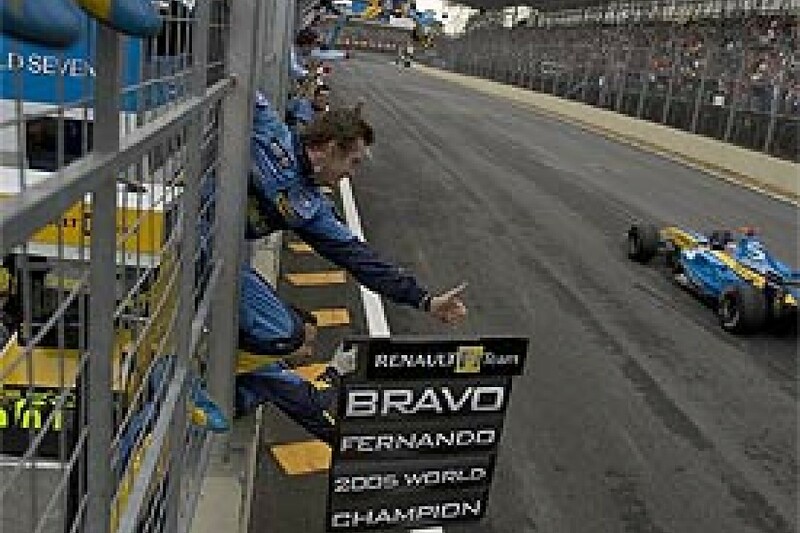 Fernando Alonso crosses the line in third position. He raises his fists and explodes in joy over the radio: he is world champion. "Fantastic. Brilliant. Super. Congratulations, you are world champion!" FA: "Thank you everybody. Thank you for everything..."
FA: "I had problems with the tyres, I was on the limit in the last five laps..."
FA: "You are the number one guys. You are the best... You are all world champions! "Great job Fernando. At every race this year."